This database provides an excellent starting point for individuals seeking genealogy information. Includes select records from the Revolutionary War, Freedman's Bank, and US Serial Set. 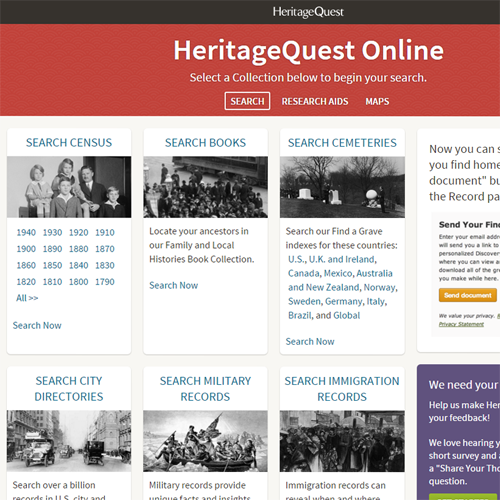 Until now Heritage Quest had always been my Go-To site for searching census.  Once again Ancestry has ruined a perfectly good research tool with their horribly inefficient and search engine. 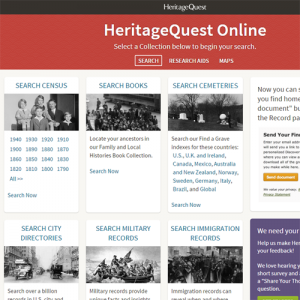 It's wonderful to be able to sit at home using Heritage Quest to search and print copies of the census. I visit the library and double check with other census records without the major expense of a membership. I work hours that don't allow me time to sit in the library for hours on end and with Heritage Quest I can search at home for hours on end. Thank you.